To begin, login to your Agent Dashboard at admin.showcaseidx.com using your Showcase IDX credentials. and click on your website. Once logged in, you should choose your website from the list of sites on the login screen. Simply click the correct URL to continue. Now you are on the dashboard for your website. At the top, click the tab for SEARCH LIBRARY to begin the Create a Search process. This is the search library! From here you can view and edit all previously made saved searches, as well as create new ones. Click the blue NEW SEARCH button at the top left to get started. 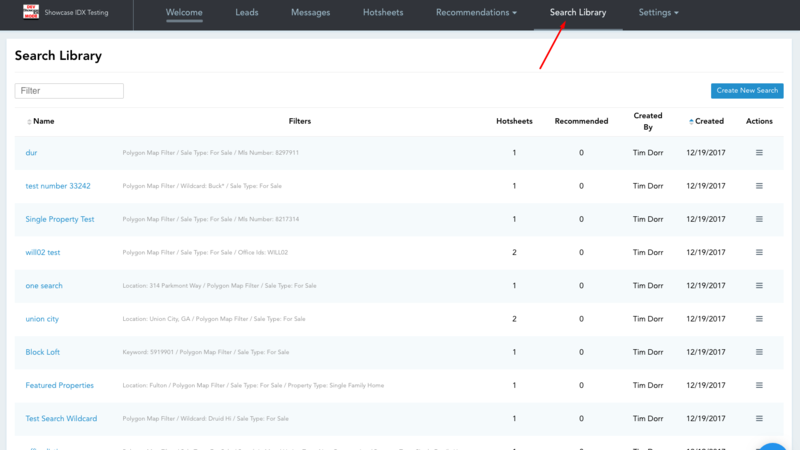 Saved Searches are the backbone of the Showcase 3.0 hotsheet and recommendation systems. They allow you to customize specific search parameters, adjust where the map is displaying, and act as a starting point for your customers in their search for a new home. The Showcase 3.0 agent dashboard makes it easy and fast to create new saved searches, and from there create hotsheets and recommended searches. The New Search interface is designed to act just like the default search on your home page, which means you can simply move the map and adjust the filters as you would on a normal search. If you plan on showing the map, you can adjust exactly how it's displayed by simply moving the Create a Search Map how you'd like it; you can even use the polygon tool and "Search in Map" features to limit results. 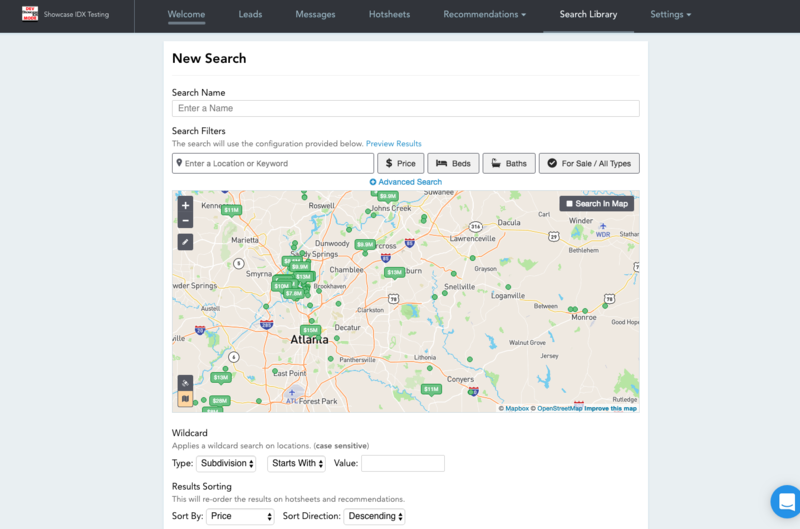 The Wildcard location search option is useful for MLS feeds that may have multiple values for a given location; agents aren't always good about consistency, so the Wildcard can help snag all listings for an area with multiple versions in the feed. For example, a subdivision called "James at the Fort" may also appear as "JAMES AT THE FORT" or "James" or "James at the Ft." Because Showcase does not have a way to normalize these locations, using a wildcard search may help you get all the listings for a popular area. Once the search is set up as you'd like it, you can set your sorting options, including filtering by agent or office ids for the members of your team. Everything look correct? Click the big blue "SAVE SEARCH" button (make sure you've named your search) and you're all set! Your saved search should appear at the top of the SEARCH LIBRARY and is ready to recommend or use in a hotsheet. This is the Hotsheets library, and shows all hotsheets that have been created. To create a new hotsheet, press the NEW HOTSHEET button in the top right of the page. In Showcase IDX 3.0, hotsheets are based on previously created Saved Searches, meaning you can create a hotsheet, add the shortcode to your WP site, and then never have to touch it again: changing which listings are displayed is as easy as modifying the underlying saved search, meaning less hassle building and updating your featured listings and community pages. 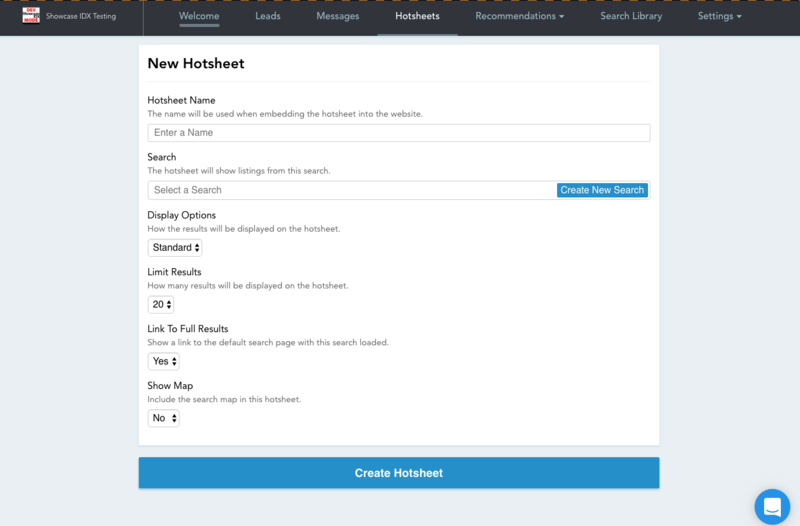 The New Hotsheet page is where you create a new hotsheet to add to your website. Make sure to give it a descriptive name before you move on. STANDARD displays the listings in a familiar way, similar to the search page: rows of listing "cards" will be displayed, just like the search results. You can also choose to show or hide the MAP, as well as limit the number of listings returned in the hotsheet (up to 60 listings). Lastly, you can choose whether or not you want to include the "SHOW ALL LISTINGS" button on the bottom of the hotsheet; you may want to hide this if you are trying to highlight specific listings on a page. 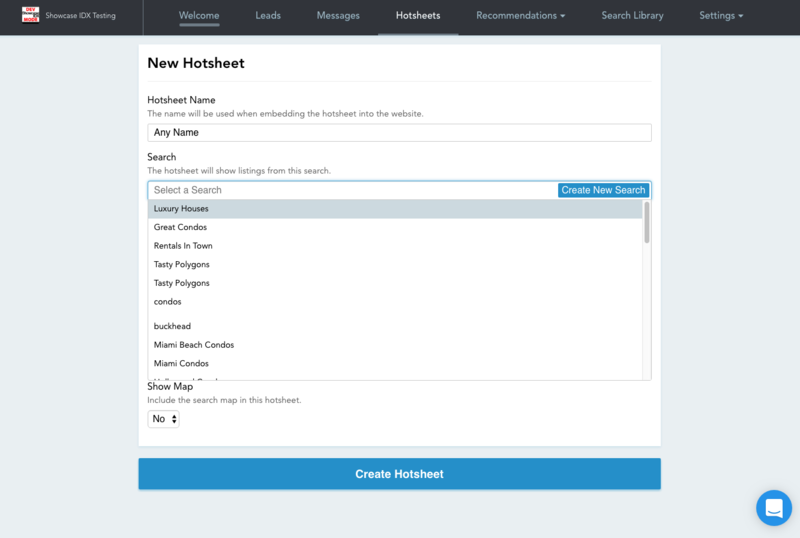 Once everything is setup as you'd like it, simply click the big, blue CREATE HOTSHEET button and you will see your new hotsheet appear at the top of your Hotsheet Library. Add the accompanying shortcode to your page, and your hotsheet will appear! Need to make changes to the listings being displayed? You don't need to touch the hotsheet! Simply go to your SEARCH LIBRARY and edit the underlying saved search; your hotsheet will automatically update to show the new listings!